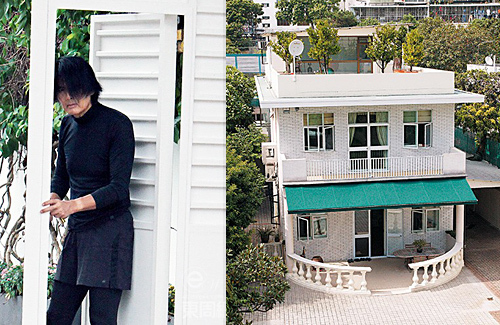 True to his down-to-earth image, Chow Yun Fat (周潤發) was recently spotted making hands-on repairs for his billion-dollar mansion in Kowloon Tong, parts of which suffered damage from Typhoon Mangkhut on September 16. Known for being a loving husband, Chow also reportedly forbade his wife Jasmine Tan (陳薈蓮) from leaving their residence in the aftermath of the typhoon for safety concerns. Back in his home while busy with publicity efforts for his new film Project Gutenberg <無雙>, Chow Yun Fat was spotted fixing parts of his gate with basic handyman tools the day after the typhoon. Peaking at a rare No. 10 typhoon signal at its maximum, nature’s fury had not only uprooted flora in his porch, but also ripped off fencing and sections of the main gate in the 63-year-old actor’s billion-dollar residence, which he acquired in the early 1990s. Appearing in his trademark all-black outfit with unkempt hair, he nevertheless exuded masculine charm as he focused single-mindedly on the repairs, while braving the risk of falling branches. Several workers only appeared in his home around noon time as the storm’s winds weakened, to clean up scattered branches and blown down fencing. Coincidentally, Chow had encountered Typhoon Hato a year ago upon returning to Hong Kong from Canada where he was filming. He was praised by the public after being spotted by a passer-by who was surprised to see the superstar helping to clear fallen trees on the roadside. sorry but he did not “exuded masculine charm” at all in that photo wearing tights underneath short shorts. @mike lol….I know omg…that’s funny. On a side note, that’s a billion dollar home in HK? Is it the pic, it looks so tiny? lol…. Did you expect him to have his hair styled and dressed in designer duds while making repairs? This not a glamour photoshoot with typhoon damage as a back-drop. @msxie0714 So did photo of him “exuded masculine charm” to you to was it the mansion that “exuded masculine charm”? the mansion exuded the opposite of curbside appeal and charming architectural detail. Lol. I thought he’s wearing a hat at first when I saw the picture above? That’s not the real fat gor I was looking at he looked totally different with his long hair and weird looking especially he wears like a girl. Really that’s his mansion? I called it Tiny Home!! He kinda reminds me of Severus Snape with his pallid skin and floppy black hair. And he also bears some resemblance to Paul Chun as the looney dad in “Recipe for the Heart.” It’s the floppy hair hahaha. I feel it is ok. I dress up very lazily at home as well. @elizabeth did you exuded feminine charm?